Dinesh Agrawal is the founder and CEO of IndiaMART.com, India’s largest online B2B marketplace for small and medium businesses. He founded the company in 1996, and since then has been credited with building on the commitment tot he SME sector in the country. Entangled in various taxes, MSMEs want a unified and simplified taxation system that will lead to a common pan-India market. The 2012-13 budget had indicated that the goods and services tax (GST) would be operational this year. However, it is yet to see light of day. Dealing with multiple taxes is still one of the key challenges for MSMEs with their small set-ups and thin management. Implementation of GST will ensure uniform tax rates, achieving a standard pricing across India. 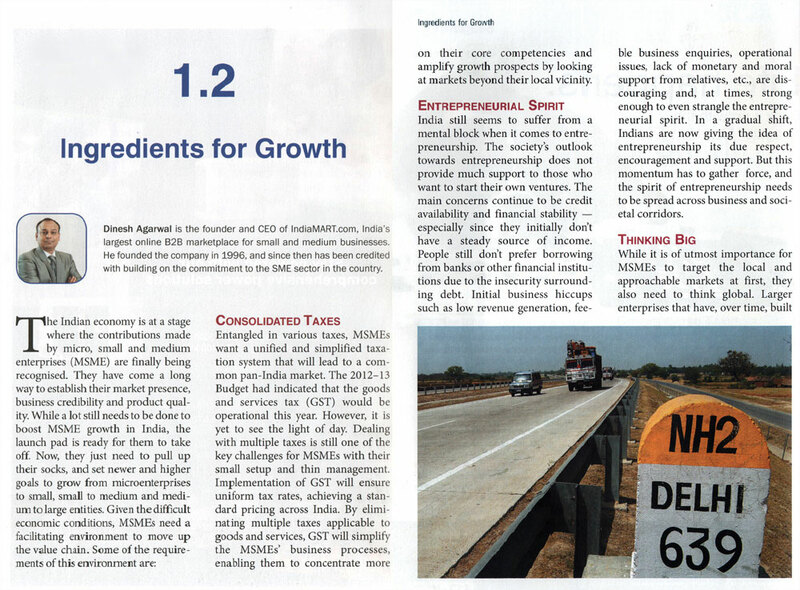 By eliminating multiple taxes applicable to goods and services, GST will simplify MSMEs’ business processes, enabling them to concentrate more on their core competencies and amplify growth prospects by looking at markets beyond their local vicinity. India still seems to suffer from a mental block when it comes to entrepreneurship. The society’s outlook towards entrepreneurship does not provide much support to those who want to start their own ventures. The main concern continues to be credit availability and financial stability especially since they initially dont have a steady source of income. People still dont prefer borrowing from banks or other financial institutions due the the insecurity surrounding debt. Initial business hiccups such as low revenue generation, feeble business enquiries, operational issues, lack of monetary and moral support from relatives, etc are discouraging and, at times, strong enough to strangulate entrepreneurial spirit. In a gradual shift, Indians are now giving the idea of entrepreneurship its due respect, encouragement and support. But this momentum has to gather force, and the spirit of entrepreneurship needs to be spread across business and societal corridors. While it is of utmost importance for MSMEs to target the local and approachable markets at first, they also need to think global. Larger enterprises that have, over time, built their competence and confidence, are scouting for partners and opportunities outside India and trying to access global markets. These units need to set benchmarks for product quality and business operations as per international standards in order to compete overseas markets. Aspirations to grow the company at an international level can only be fulfilled by improving production efficiency, building robust business models and striking right business partnerships at right time. The internet has changed the way people live their lives, and has had countless benefits for business too. Optimal use of the Net has worked wonders for MSMEs. Being online gives suppliers exposure to various opportunities. Similarly, faster penetration of internet in tier II and III cities can make local artisans and micro enterprises far more accessible to the world. Also, web applications improve the effecencies of day-to day operations, while serving as an important yet cost effective marketing tool. As of May 2012, India boasts of over 960.9 million telephone subscribers of which mobile phone connections have crossed the mark of 900 million. Yet, we have not been able to exploit this massive reach. MSMEs should consider the future prospects of mobile communications and invest in developing mobile applications that could help their businesses grow. Indian MSMEs have had a rather narrow approach towards using social media for business despite deep penetration into our lives. While they appreciate its utility in garnering a broader online presence, they have not been able to leverage successfully. It is the most dynamic and widespread media to emerge in recent times, engaging hundreds of millions of people worldwide. It allows people and businesses to build opinions, know expectations, gauge trends, etc. and MSMEs should use this this medium to their benefit. The government’s decision to allow 100 percent foreign direct investment (FDI) in a single-brand retail and 30 percent mandatory sourcing from MSMEs are significant steps to bring growth opportunities to MSMEs. This will allow them to prove their mettle and raise their product quality and service to international standards. Although there have been attempts to dilute the provision, the government would be well advised to resist any such move, so that MSMEs have time to make full use of the provision. 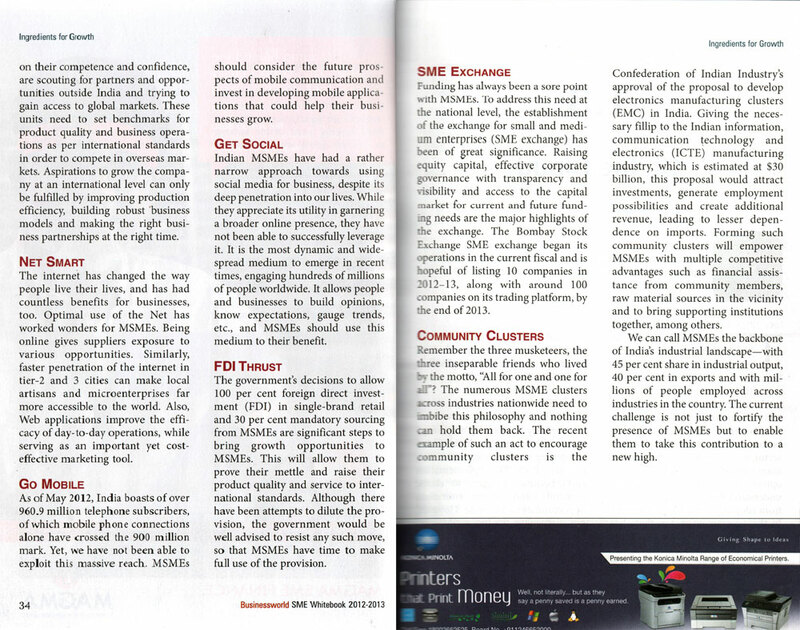 Funding has always been a sore point with MSMEs. To address this need at the national level, the establishment of the exchange for small and medium enterprises (SME exchange) has been of great significance. Raising equity capital, effective corporate governance with transparency and visibility and access to the capital market for current & future funding needs are the major highlights of the exchange. The Bombay Stock Exchange SME exchange began its operations in the current fiscal and is hopeful of listing 10 companies in 2012-13 along with around 100 companies on its trading platform by the end of 2013. Remember the three musketeers, the three inseparable friends who lived by the motto, “All for one and one for all”? The numerous MSME clusters across industries nationwide need to imbibe this philosophy and nothing will hold them back. The recent instance of such an act to encourage community clusters is Confederation of Indian Industry’s (CII) approval of the proposal to develop Electronics Manufacturing Clusters (EMCs) in India. Giving the necessary fillip to the Indian Information, communication Technology and electronics (ICTE) manufacturing industry, which is estimated at $30 billion, this proposal would attract investments, generate employment possibilities and create additional revenue on imports. Forming such community clusters empower MSMEs with multiple competitive advantages such as financial assistance from community members, raw material sources in vicinity and bringing supporting institutions together among others. We can call MSMEs the backbone of India’s industrial landscape — with 45 percent share in industrial landscape, 40 percent in exports and with millions employed across industries in the country. The current challenge is not just to fortify the presence of MSMEs but to enable them to take this contribution to a new high.